This is the perfect desk for the executive at home or at the office. Features include four deep storage drawers for books and important papers, two utility drawers for disks, cds, and stationary and a concealed center keyboard drawer. 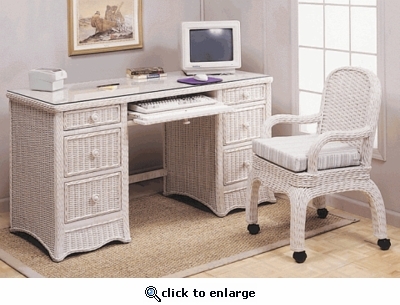 Each desk is crafted of bold wicker that is tightly handwoven over a strong wood frame. Whistwash finish only.